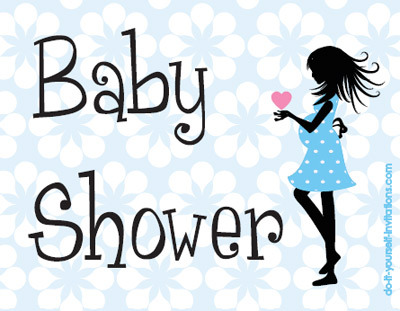 These printable baby shower postcard invitations are a super simple and affordable (free!) option to your baby shower planning needs. These invites are "print on demand" and available for instant download. To use the postcard invites, simply print the PDF file onto some heavy white cardstock. Print the file so the pages appear back to back on the paper. I always recommend using the highest quality print settings for best results. Cut the invitations into quarters by cutting the paper in half, and then half again. Trim the edges and viola! You've got yourself some nifty DIY baby shower invitations. I included this invite in a few different color palette options. Hopefully these colors will match most any shower theme/color. I hope you enjoy them! Also available is this printable arts and crafts postcard template. This file is the very bare basics of creating a homemade postcard invitation. This is great for the paper crafts enthusiasts who simply wants to decorate the back with their own creative works of art. This also makes for a fantastic kids craft project. Let them make their very own baby shower postcard invitations to help welcome their new little brother or sister. 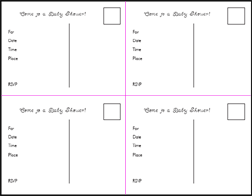 Print this postcard template onto 8 1/2" by 11" cardstock in a color of your choice. They are meant to be decorated by hand on the opposite side to create the postcards. Try browsing some of the invitations on this site to come up with some ideas of how to decorate them. You can use decorative paper, stencils, stickers, to name a few. You can even print graphics of your favorite themes or characters onto the opposite side. Add an address label and pop em in the mail and your on your way to having a great baby shower!